P&PTuesTAY: Now with 100% Less GTAV! Filed to: P&PTuesTAY!Filed to: P&PTuesTAY! Welcome back to P&PTuesTAY, where we discuss various aspects of pen and paper gaming! There was a slight hiatus last week as I was ill and not up to coming up with content for a full article. However, I am now healthy, and after having a good P&P session this weekend, ready to go! In the first session (Vampire) , the lack of dice usage was because we were free-form playing the time between “missions” and a lot of that RP was done between group members with minimal input by the Storyteller. In our second session (D&D 3.5) the DM was using the session as a “flash forward” to our players, and then pulled us back out of said flash forward to move the current storyline forward. The third session (Scion) was an instance of the Storyteller using a scenario as a way to push the players out of their comfort zones and force them to confront issues or situations in different ways. The first and third sessions used the RP as a way to build story along with skill checks and some limited combat. The second session, however, only required me to roll dice when I pushed for it to be done. I have to say that I am definitely a role-player at my core, but there is something to be said about letting the dice determine successes and failures, and playing those results out. 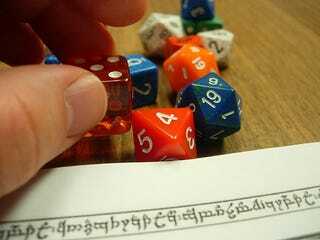 I am all for a DM or Storyteller setting a scene or using situations to push RP and development of character, but when my character is going to “do something”, having the action just happen feels like a bit of a cheat. Part of the dice rolling is to tempt fate; to create a situation where you may NOT be successful in the things you do, and seeing how you deal with those failures. I am aware that it is a DM’s prerogative to “cheat” to create tension or the dramatic last-minute save, but to play that way for the majority of that second session was a little disheartening for me as someone who enjoys letting the dice decide things. As usual, I’m interested in hearing how you guys deal with this type of situation? Are your DMs and Storytellers more or less free with RP and actions, or does your group tend to play in more of a “roll for it” style? If you are a DM, how do you decide when to focus on RP and when to “roll those bones”?